Everything about this story is so unlikely, choosing the title for the book was easy. So many dreams we have as adolescents are unlikely to come true; we find it pretty easy to forget them after a while. The more ambitious the dream, the more unlikely it is to last into adulthood, let alone come true. Yet, every once in a while—maybe only once in a lifetime—that cast off dream we had as a kid gets revived by unexpected, even unlikely, circumstances. And that is how it went in my case when a chance encounter that led to new friendships resulted in the opportunity to fulfill one of those dreams that never die. Going to Bonneville to run a motorcycle as fast as it could go in land speed racing competition was the dream. Just getting to Bonneville, nearly 1,500 miles from my home in Wisconsin is something of an undertaking in itself. Hauling old motorcycles restored to running condition to compete—well, that’s a real reach. I’m not what most folks would consider an expert mechanic. Average at best with a hodge-podge of economy grade tools, often scavenging parts and improvising repairs, I had my doubts about even getting the two old motorcycles I worked on for competition to run, let alone run fast. There were a lot of missteps, miscues, and mistakes along the way; some dumb, some funny, some not so much. Coming to grips with the experience that was both fun and seriously intense at the same time was challenging. With so many machines going flat-out and so many critically important rules to keep in mind, things can go very wrong very fast. Most motorcycle racers are in their twenties or thirties and weigh an average of 120 to 150 pounds. I was well past the mark on both counts. It’s safe to say that even non-motorcyclists would not mistake me for any kind of motorcycle racer; not even in bad lighting. Despite that, this experience reminded me that age, physical ability or disability need not necessarily define me or any of us. The book tells of meeting some remarkable people whose passion for the challenge enabled them to overcome supposed barriers of age and physical disability to not only compete but set records! They inspired me, and they are each the embodiment of the spirit of Bonneville. The Bonneville International Speedway is a place of legend in motorsports history. The highest speeds people have ever achieved on land—including on motorcycles—were achieved there. Its vastness and breathtaking beauty would be reason enough to go there. Getting there to compete and perhaps write a line in the record books is a chance to become a part of motorsports history. The first trip there was in 2009, where a 25-year-old motorcycle took me through the timing traps at over 100 mph on only my second run on the salt! In 2010, another trip there resulted in the first tentative national speed record, only to have the speed beaten later in the event. In 2012, we tried again and in 2014, that most unlikely outcome took place! UPDATE (December 10, 2013): Thank you to everyone who submitted to TPP’s first annual 25 Days of Christmas short story event. After sifting through the submissions, we were able to select only a few that met the minimum submission requirements. The first story will be posted later today. Winners will be notified via email on December 23 with the list posted here on December 24, 2013. 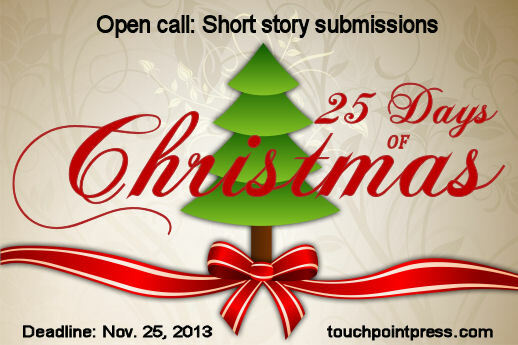 We’re excited to announce TouchPoint’s first annual 25 Days of Christmas short story event. We’re gearing up for fun, sharing, and the spirit of giving. November 25, 2013 @ 11:59pm CST. Late submissions will not be accepted. We will select the top 25 stories and post a story a day at TouchPointPress.com from December 1, 2013 through December 25, 2013. TouchPoint will select a top contributor in each category (fiction and nonfiction) to receive a $25 Amazon gift card. Ready to submit? Use the form below.